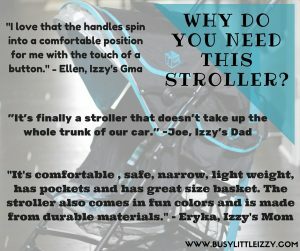 What’s the worst part about the stroller for you? Getting your child in and settled or keeping them content? For me it’s both! I pulled some tips together for you. Izzy isn’t the best in a stroller or carseat or really anything that restrains her. I’ve learned how to keep her comfortable & content while riding. 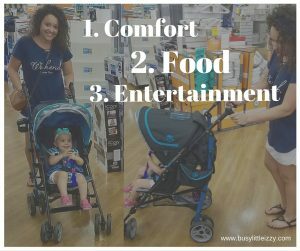 3 Things to remember is you need to make sure you’d child is comfortable, fed & entertained. Comfort: I like to take off Izzy’s shoes because she prefers to have free feet when in a carseat or stroller. Be sure to add a fan if you are strolling outside. Another important tip is to dress comfortable for being seated and strapped in. Comfort can also be a mental thing. Be sure to explain to the child. You are going into your stroller. You can sit with your teddy bear or baby doll. Giving choices and explaining to your child what is happening will give them some mental peace because they feel apart of the decision vs just told what’s going to happen without any choice for them. 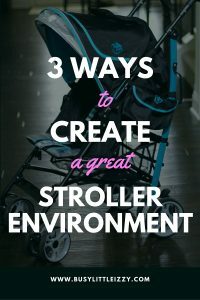 Mostly you need to chose a comfortable stroller, but not only for your child for you as well. I’m pretty obsessed with my new umbrella stroller from Delta Children. This stroller is the J is for Jeep Brand Scout Stroller. 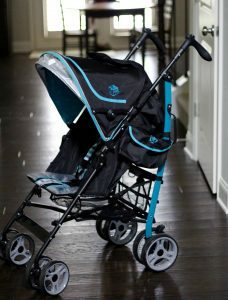 Check out this stroller and order yours here. 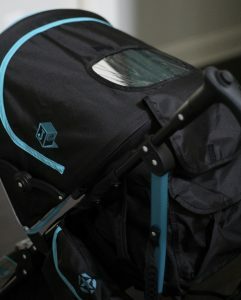 This stroller has reflective material which makes to great for day or night use. The adjustable handle rotates into 8 easy adjustable positions. The seat of the stroller reclines and it has a 5 point harness. Food: If you don’t always have snacks on you, I’m not sure how you survive most day to day as a parent. Am I right mommies and daddies? I love to have snacks on hand for Isabella & drinks as well. This is just another reason I love the Delta Children Scout stroller, there are pouches that can hold snacks and a cup holder for her drink as well. Entertainment: I keep toys, teethers, books and lastly the mac daddy… i pad! These items keep her hands and mind busy so she doesn’t feel like her body needs to be. 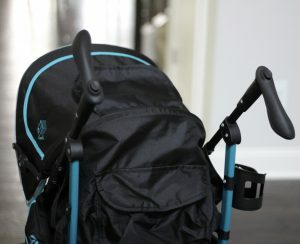 Don’t forget to check out the J is for Jeep brand Scout Stroller from Delta Children here. Love this stroller! And great tips too! This looks like a stroller I need to add to my list!! Great advice! And the stroller seems awesome! Great advice! And the stroller looks amazing! Great advice! And I love the stroller! This looks like such an awesome lightweight stroller! I’d love to try something like this out instead of our heavy and bulky stroller! Yes it’s nice to have an alternative! Seriously this looks so amazing and like its got supreme storage for something lightweight! !